These notes were compiled from material gathered since 1980 by personal research & correspondence. Other than my grandmother, aunts & other individuals mentioned in the narrative, I am especially grateful to the following "cousins" whose records, photographs, stories & oral traditions, along with my own, helped us all gain a better understanding of our East family heritage. If these notes, excerpts or photos are copied, shared with others, published or displayed on the internet, it will be appreciated that proper genealogical etiquette be observed, acknowledging the compiler. Any "legitimate" additions or corrections, etc.will also be greatly appreciated. MARTIN ALONZO EAST, the son of Joseph & Permelia (Cason) East, was born 10 Jan 1839 near Highland, Madison County, Illinois. In 1817, Martin's father Joseph settled in Illinois as a youth with his parents James & Mary "Polly" (Edwards) East who left the Red River area of Robertson County, Tennessee, their farm lying very close to the Kentucky/Tennessee border. Prior to that, they resided in Oglethorpe County, GA where Martin's father was born about 1807. Martin's ancestors were all farmers. Martin's paternal grandparents, James & Polly East left Henry County, Virginia during the late 1780's & settled in Georgia along with James' parents James & Eushan East Sr. Mary "Polly" was the daughter of Edmund & Elizabeth Edwards who also settled in Oglethorpe Co GA, but later traveled to Robertson County, TN about 1812 with James & Polly. Martin's mother Permelia was born about 1812 in Screven County, GA and came to Illinois during the 1820's with her parents Hillery & Mary (Smith) Cason. Hillery and his father Hillery Sr came from the Pitt County, NC area before settling in Georgia during the 1790's. During the 1840's after his father Joseph died, young Martin, his twin sister Mary & older brother Calvin left Illinois & accompanied their mother, Cason grandparents & other relatives to the Batesville area of Independence County, Arkansas. Martin's mother Permelia married Dr John Morris in 1850, who became the step-father. Family tradition & other evidence suggests they held their step-father in high regard. Their family farm was located east of Batesville in the Gainsboro area of Independence County. In 1859, when he was a young 20 year old man, Martin was ordained a Methodist minister, becoming a "circuit rider", traveling throughout various areas of Arkansas performing his ministorial duties. His mother Permelia passed away in 1860. While with the Greenwood Circuit which was headquartered in Sebastian County, Arkansas, he met his future wife Miss Eliza Harriet Jones, the daughter of Sebastian County pioneer settlers, John & Narcissa (Rutherford) Jones. On 3 Feb 1862, shortly after the beginning of the Civil War, Martin married Eliza at the home of her parents in Sebastian County. Eliza was born 3 Feb 1842 in Greene County, Tennessee. Eliza’s parents left Tennessee when she was an infant and settled in Crawford County, Arkansas, in the area around Auburn & Bloomer which later became part of Sebastian County. Eliza's father John Jones became one of the first commissioners from Big Creek Township when Sebastian County was created in 1851. A "family tradition" related to me by Theral Jones of Greenwood, Arkansas suggests that Eliza Jones, as an infant, fell overboard into the Mississippi River while the family was enroute from Greene Co, Tennessee to Arkansas. She was about 1 year old since this journey was made about 1843. Theral Jones is a descendant of Eliza's brother Robert M. Jones. Another "family tradition" related to me by the late Juanita (McClellan) Greenfield of Fort Smith, Arkansas suggests that during the Civil War, Eliza & other family members came home to find their brother George Jones hanging from a tree on their father's place in Sebastian County. They supposedly cut him down and buried him in the Jones Cemetery. Official documents of their mother Narcissa's Civil War claims suggests that George Jones was shot by southern bushwackers and died in the arms of his wife. However, Narcissa's brother Gus Rutherford was hanged by these southern extremists. In a letter from a daughter of Robert M. Jones, Lona (Jones) Thornton, there is a "tradition" that Robert, as a child, was put on the shoulders of a friend and helped cut Gus down from the tree. In March 1863, Martin Alonzo East traveled to Fayetteville, Arkansas & enlisted in Company "I" 1st Ark. U.S. Volunteer Infantry of the Union Army. His older brother Calvin had joined the Confederate Army & was killed just a few months prior at Murphreesboro TN. This was truly a war of brother against brother. After the war, Martin brought his family back to Independence County, Arkansas, but returned to Sebastian County by 1870, settling on a farm near Auburn. For many years, he continued to farm & perform duties as a local Methodist minister. Martin and Eliza had a large family of 13 children, 2 of them dying in infancy. Rev. Martin Alonzo East died 23 Jan 1913 and was buried in Pinnell Cemetery, which was later relocated to Center Valley after the establishment of Fort Chaffee during World War II. His wife Eliza passed away almost 13 years later 1 Dec 1925 while staying with her son Bonnie & family in Arkoma, Oklahoma, which is just across the line. She was buried next to her husband in the Pinnell Cemetery. NOTE: There was another woman named DAISY B. 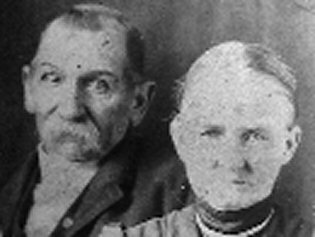 EAST who married AUTHUR L. RATTEREE on 21 Dec 1892 in Sebastian County, Arkansas. This other Daisy B. East was born 1874 in IOWA & was the daughter of JOHN & REBECCA EAST who settled in the Van Buren area of Crawford County, Arkansas near Sebastian County around 1890 from the Shelby & Jasper County area of IOWA. Her father JOHN EAST, born 1834 in INDIANA, was the son of HUGHS & ROSENA (HODGE) EAST who settled in Lawrence County, INDIANA during the 1830's from Surry County, NORTH CAROLINA where their ancestors had settled during the 1700's. DAISY B. & AUTHUR RATTEREE later moved to Beaumont, TEXAS where they still resided in 1930. THERE IS NO KNOWN CONNECTION TO MARTIN ALONZO EAST.